"This is a great soup recipe for a cold winter day! Warms you inside and out. It is very hearty. 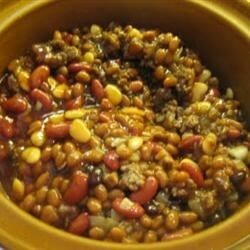 If you love beans as much as I do you will definitely love this recipe. It is my husband's recipe. He makes about 10 prepared packages and presents them in decorative jars as gifts for Christmas." To make Bean Soup Mix: Combine yellow split peas, green split peas, limas, pinto beans, kidney beans, great Northern beans, onion, bouillon granules, cumin and garlic powder. Store in an airtight container until ready to use. To make soup: Bring Bean Soup Mix and water to a rolling boil in a large pot. Cover, remove from heat, and let sit 1 hour. Return pot to heat, stir in carrots and celery. Stir in ham hocks, bring to a boil. Cover, reduce heat and simmer 2 hours, until beans are tender, skimming fat as necessary. Remove ham hocks from soup. Remove meat from bone, chop and return to soup. Heat through and serve. I made this last Christmas for gifts Had rave reviews about it. took a year to find it again. Now have a recipe box. Can't go wrong with this recipe. Wonderful!!!!!! Looks much better than it tastes. Its a great starting point though! This recipe is really nice as a gift and requires only a few "fresh" ingrediants later. The flavor is super too! Great soup, I made this mix in a jar for gifts. Good made in crockpot as well. Cut the time in less than half by using a meat-grinder or food processor to crack all the beans!